High turnout among population, even Christian, and without any force or pressure to vote. AsiaNews source: a vote that calls for a redrawing of regional power balance, after Saddam, extremist violence and Isis. The "courageous dialogue" demanded by the Chaldean patriarch for a political solution. Fears over Erdogan’s “grave” threats. 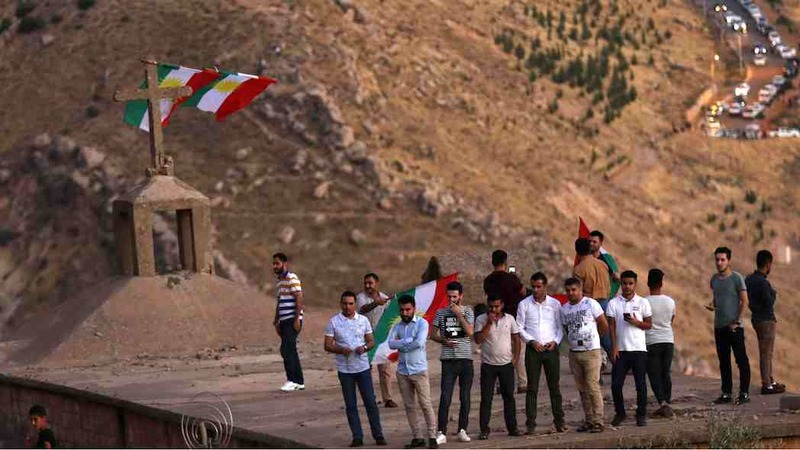 Erbil (AsiaNews) - "The turnout was high and the vote free and fair” in the Kurdistan referendum on independence from Baghdad, held on 25 September, even among Christians resident in Iraqi Kurdistan. Most of them "are favor an agreement with the Kurds, a position they have expressed "without external conditioning, pressure, or force ", says an AsiaNews source frm the Catholic community in Erbil, on condition of anonymity because he is not allowed to speak to the press. He relates that the vote took "in full conscience and freedom." However, he adds, there are fears because of the threats coming from outside, particularly from Turkey and Iran, "very serious" words that cast a shadow "over the future of the region". The referendum was sparked by the ever deteriorating and complicated relationship between Erbil in Baghdad, which even today, by the mouth of Prime Minister Haider al-Abadi, has demanded "the cancellation" of the vote. According to the regional authorities the referendum is not an attempt to break ties with the Iraqi people but clarify positions, roles, competences and freedom of action with the central government. From the point of view of coexistence that has become increasingly difficult over time. Initial result indicate a "yes" victory that varies between 80 and 90% of voters. "Even Christians - the source says - are largely favorable, and only an Assyrian party, with its leaders in Baghdad, was contrary." Within the same Christian minority "there was a high turnout", also as a result of "strong ties" that have been created in recent years "with the Kurds and the local people". Since the fall of Saddam Hussein to the rise of the Islamic State (IS, formerly Isis), through Islamic extremist violence, many events have changed regional relations, balances and dynamics. "14 years after the end of the regime - the source says - it is not possible to continue this, especially in a security perspective. What is needed is clarity on the political agenda and agreement on a shared way forward, otherwise it would be better to promote a new road, in the name of good neighborly relations. " There is a "an atmosphere of happiness" on the streets of the cities and villages because of what everyone judges "a democratic expression of the will of the people". At the same time, with the passing of hours, there is a concern about "the warnings coming from Baghdad", but above all the threats from Iran and Turkey. "Erdogan's words - the source says - about starving the Kurdish people are unacceptable." In spite of newspaper articles or rumors on the eve and during the vote, he states, "no one was forced to vote and the majority freely chose yes, but even those who opposed it could express their preference without intimidation of sorts. To testify, there are also reports from Europe, the United States and the United Nations observers who were present throughout the in the polling stations, as well as the phone calls I made personally with friends and relatives in Erbil, Sulaimaniyah and Dohuk. "